It’s natural for your body to feel a bit inflamed this time of year—especially after several holiday meals and treats. If you decide to detox after the holidays, it may be wise to become familiar with some home remedies for bloating. In fact, as you’ve probably already noticed, the uncomfortable feeling isn’t limited to just your stomach. “Bloat can be swollen fingers, bags or puffiness under your eyes or in your face, swelling in your belly, and an overall feeling of lethargy or heaviness,” says health coach Mia Stern. Regardless of where you’re feeling bloated, the effects are nowhere near pleasant. So in order to (quickly) remedy the situation, we’ve gathered all our information for you in one place. Instead of taking over-the-counter medication, try these natural options that will do the trick in no time. Below, find the seven home remedies for bloating and gas that are total lifesavers. Tip: Keep this list somewhere safe. This particular herb boasts carminative properties—meaning that it helps reduce gas and prevents bloating, says Angela Lemond, a Texas-based dietitian and nutritionist. A 2008 study found that ginger aids in the process of digestion and helps remove feelings of discomfort and bloating. You can take it in the form of capsules or chews or brew some ginger root in hot water. When I explained to my doctor that I was experiencing nausea occasionally, probiotic pills were the first thing he suggested. Those containing Lactobacillus, acidophilus, and Bifidobacterium lactis work to reduce bloating. In fact, a 2011 study found that 60 individuals with bowel disorders reported reduced bloating when they took probiotics over an eight-week period. Chamomile tea helps to settle an upset stomach, so it’s no surprise that it’s beneficial in this situation. Chamomile itself has anti-inflammatory properties, and one study found that it even reduces gas, calms the stomach, and aids in moving food through the intestines. Simply drink a cup of the tea or make an infusion with chamomile, peppermint, lemon balm, and fennel seeds. 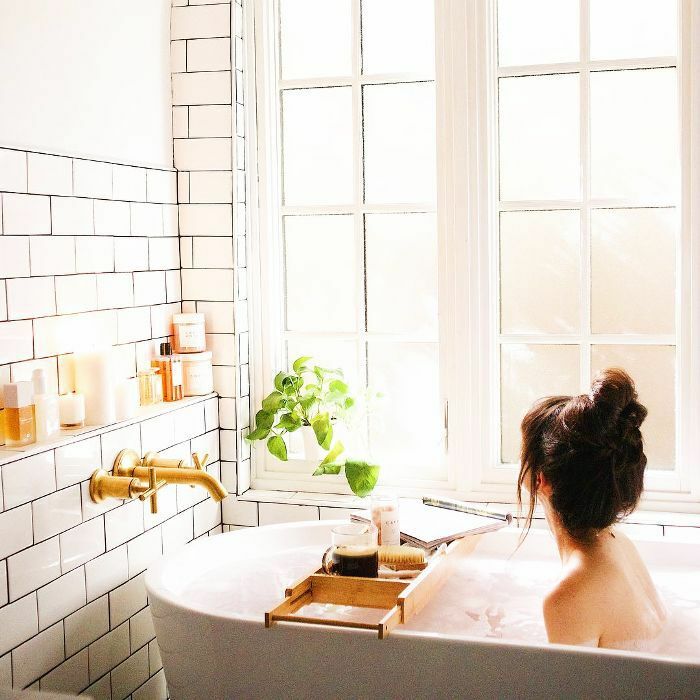 Apple cider vinegar (ACV) may be all the rage when it comes to cleansing (celebs swear by it), but it’s also helpful in treating gas and the feeling of bloat. Raw ACV is packed with enzymes that amp up your digestive system. Just add one tablespoon to a glass of warm water and drink it before your next meal. We’ve already mentioned putting fennel seeds in a chamomile infusion, but they’re also helpful in treating the pesky bloat feeling altogether. The seeds themselves have oils that work to stop inflammation, bacteria, and microbes. Fennel seeds also boost your digestion and can be purchased at the grocery store. Alternatively, you can buy the seeds, crush them, and then boil them to make your own homemade brew. Who else wants yet another reason to drink spa water? The rule of thumb is that you should be drinking about half your weight in ounces of water, and if you infuse it with something good like cucumber, you’ll want to drink more of it. Another fun fact: Cucumber water is a natural diuretic because it contains silica (which removes the bloat from your body). Do you have your own home remedies for bloating? Share them with us in the comments, then read about the anti-inflammatory smoothie Karlie Kloss swears by.